Nintendo President Tatsumi Kimishima gave a presentation to investors this week, and some of the most interesting details revolved around the new Nintendo Account system and the related My Nintendo programme that'll replace Club Nintendo. Though it's succeeding a much-loved and retired loyalty scheme, My Nintendo represents the first step in Nintendo's drive to greatly expand and improve its approach to user accounts. Registration for Nintendo Accounts will start - alongside the same process for Miitomo - on 17th February, ahead of a March arrival in 39 countries. It's a representation of why Nintendo invested a substantial amount of money and time in a partnership with DeNA; it's a deal that involves the creation of smart device apps and games, of course, but it's also about infrastructure. With experience in running sizeable online platforms and services DeNA clearly has a lot of expertise to share, and the My Nintendo service is essential to that. It'll have two types of reward 'currency' - Platinum Points will be awarded for playing smart device games, accessing the eShop and when meeting other conditions. Gold Points are more conventional, awarded for buying Wii U and 3DS content from the eShop. Platinum Points - These will be redeemed on 'a range of digital content', covering multiple platforms. So those that pre-register for Miitomo will receive a Platinum Point to use in the app (odds must be short on it being a Mii outfit). Gold Points - This is a throwback to the Wii U Premium / Deluxe ID scheme; you buy games for gold points, then get an eShop discount to spend on more games. Platinum Points will only be earned on Wii U and 3DS for accessing the eShop, without the clever ideas we're likely to see in early smart device games (we suspect NX will use the feature fully, however). To get points on Wii U and 3DS you'll need to link your Nintendo Account to your Nintendo Network ID, just as we had to with Club Nintendo. There'll be no such requirement in Miitomo, remember, and the Nintendo Account is being established to be accessed and created with logins from the likes of Facebook and Twitter. In other words, you won't need a Nintendo Network ID (via a Nintendo console) to create a Nintendo Account. In the current generation of hardware, Wii U and 3DS, we have what is a perfectly passable and acceptable bodge job - that term may be unfair, as it was probably quite a challenge to implement the programme. In essence it looks set to be like a mix of Club Nintendo and the now-defunct Wii U Premium / Deluxe loyalty promotion, albeit far more convenient and no doubt exceedingly modern compared to its archaic predecessors. We'll get money off vouchers for buying downloads, and we'll be able to enjoy the "fun" side of Platinum points (with downloadable goodies) just by logging into the eShop. If the concept slide below is any indication that could include exclusive 3DS HOME Themes, for example. On top of that there'll be a global roll-out of online eShop purchases, at last, a feature that's long been available in North America and recently in Japan - read about a game on Nintendo's website, buy it and it'll automatically download to the relevant system, all using your Nintendo Network ID (via a Nintendo Account, in the new system). It's a nice idea, and our hope is that the current setup will be expanded to allow you to browse and buy any game on the eShop, not just major retail titles; every download has official game pages in each region, so that should be on the cards. Where the system is set to shine, however, is in Miitomo and beyond. Pre-registering for the app will require a Nintendo Account to be setup, which (as a reminder) is the general name for the login you'll have for accessing and enjoying My Nintendo. Notably Nintendo isn't making a Nintendo Account mandatory with downloads of Miitomo after it launches, so that it doesn't scare away casual dabblers, but you can be sure the app will be showing regular notifications to encourage users to create one. The key point of the My Nintendo membership programme is that it'll be open to absolutely anyone, not closed off to those with Nintendo hardware. Nintendo's initial target of 100 million members may sound bold, but in this age of over a billion smart devices and considering the company's brand power, it's not too outrageous. The core concept is simple - the My Nintendo service will be a bridge between Nintendo systems and smart devices. If the bridge is going to be a functional but rickety contraption in this generation, it's likely to be a construction masterpiece in years to come when smart devices and the mysterious 'NX' hardware come together. The key slide for this is below. Coming in March are reward points, some neat features and custom offerings to suit individual members. But look to the right at the planned ideas - managing friend relationships, co-ordinating cloud data and perks at external sites such as retail stores. 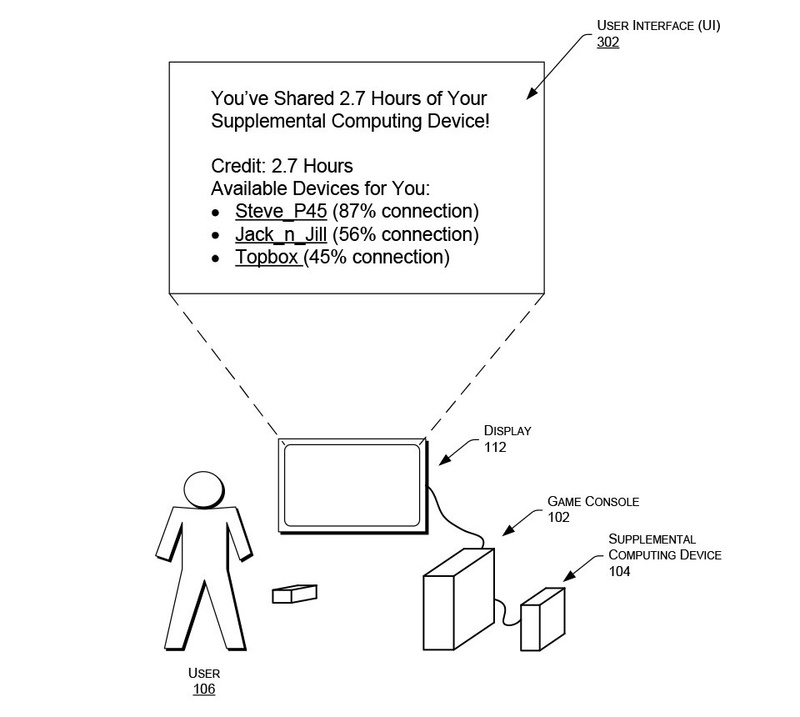 The reference to cloud data is particularly promising, and immediately brings to mind a 2014 patent - unearthed late last year - for a 'supplemental gaming device'; that document was linked by some to a potential NX concept, in which a device would have its own capabilities but could also be boosted by utilising the Cloud - using online resources for improved performance and power. The sense from the patent is that using the Cloud - in all of its bandwidth hogging glory - would be optional, but could also enable an interesting approach to scaling up the system to deal with tougher programs and games. The Nintendo Account reference to cloud data seems pertinent with the following image from the patent, however. It gives an example where you could make your device (and presumably some bandwidth) available on the cloud for others to use, and that doing so would bring its own rewards. In light of Kimishima-san's presentation and the idea of the Platinum Points that patent suddenly seems even more relevant, albeit it's purely speculative at this stage. The other two ideas for the future are also promising - they hint at a potential friend system that's less fiddly and console-specific, and reiterate previous comments that stores, resorts and events could be tied into promotional My Nintendo giveaways and incentives. All the more encouragement to have the relevant Nintendo apps on your smart devices and relevant gadgets. What this probably means, for the long-term, is an end for the Nintendo Network ID. We've loved the idea behind it since day one, but have equally complained about its limitations. Nintendo successfully integrated IDs across Wii U and 3DS, it's worth saying, but it never resolved the archaic - and potentially frustrating - reality of accounts being tied to hardware for consumers. What's made that requirement an irritation is that, in theory, the logins are in the cloud, as Nintendo customer services can move your data and games to other systems. For us, though, the end users, it's been an old fashioned and stubborn account system. When we referenced a 'bodge job' early in the article we were highlighting the fact that Nintendo Network IDs will live on for as long as they're supported on Wii U and 3DS; there's no indication that current-gen hardware will see a major overhaul to their account system. The new Nintendo Accounts, and their My Nintendo memberships, will be joined up with the NNID's in a process that was probably concluded with the words "it'll do". Yet in future for smart device apps and most certainly in the NX hardware, the likelihood is that they'll all come under the one banner. We'll have a simple Nintendo Account login, which automatically entitles us to My Nintendo membership and all of the related perks, and that will work naturally and flawlessly across all platforms and related network features such as online gaming, friend lists and more besides. It's likely that clever security measures (like those used on smart devices and other consoles) will be used that allow you to easily transfer your games and data to replacement hardware, for example, without physically moving SD cards around and using local wireless signals. We'll enter the Cloud Data age, and it'll all be very convenient and simple. What's hugely promising about the Nintendo Account and My Nintendo programme is how Nintendo will be able to leverage such a broad range of users and use that to sell dedicated hardware. If huge numbers of people get free apps and enjoy them, the inevitable in-app marketing and promotions will point them to dedicated hardware - that circle of user numbers and up-selling has been at the core of Nintendo's goals ever since it hooked up with DeNA and started moving into smart devices. The prospect of clever and dynamic Points incentives - and rewards - matched up to our profiles, along with convenient integrated services and cloud data, is certainly enticing. It could be a new age of user accounts with Nintendo, in which it not only matches up to the modern offerings of its rivals but explores new ideas and approaches that lead the way. 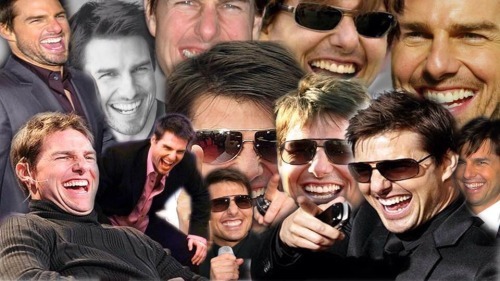 Nintendo having one of the most accessible and enjoyable user account systems? It's not as crazy as it sounds. And let's face it: The discounts they will give for digital purchases will mainly be for retail releases that will still be a lot cheaper in physical form. At least that's what's been happening in Japan with the discounts they already had since the start of Nintendo Account there. I'm sad to see no physical rewards but I'm more and more leaning to a digital only. Especially if it is now cloud saved + cross device. It will take more than a reward system that offers around 10% back from eshop purchases (going by the US old system) to make me not buy the physical game with a discount of 15-25%. 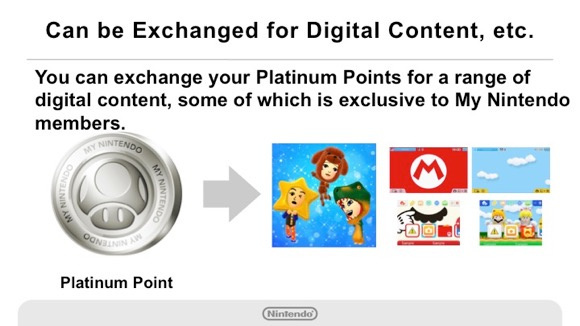 And the graphic for the platinum points rewards seems to show 3DS themes. What use will they be for the "new users" of the Nintendo Account who are supposed to be those who do not already have the hardware? I know it will show what you can get if you buy, but will that really drive sales? If this is the new "proper" account system then I dont mind going digital games only going forward. ◾Platinum Points - These will be redeemed on 'a range of digital content', covering multiple platforms. So no phisical goodies anymore. I liked Club Nintendo's physical rewards where you can get awesome posters and other physical rewards. The old system was very archaic, so hopefully this new thing will be a vast improvement. It's looking good so far, though there's still lots of unknowns. I can't understand why Nintendo decided not to reward those of us, whom are still the majority, that buy physical purchases. If they managed to do it with the old Club Nintendo then why can't they with a brand new system? Also I fear the digital rewards will be crap at best, offering small discounts on games you can buy cheaper in retail. I will miss the physical items. Nintendo's draw is their stable of characters and having a poster, case or whatever was a nice way to further enjoy them. It's a shame that's going away. A point for your data and a point to push an ad to your friends. Now you're loyal to Nintendo! "It'll do" sounds about right. No apparent change to accounts for current hardware is a bit disappointing and does point to digital dominance on NX. Prices being higher for digital I would expect greater rewards. Everything points to future potential, but actual changes benefical to end users of current Nintendo hardware are very small. NNID still tied to consoles, no cross-buy etc. I think this is preparation for NX and 3DS/WiiU owners won't be much better off unless you live somewhere where only digital is available or there was no Club Nintendo before. Very good for those customers, but then it really should have been implemented before now. @manu0 Same. I'll still be buying physical releases. I don't care if the rewards we get are digital only, but we should still get points for physical purchases. I know they are really pushing towards the digital age though. Oh yeah! Thank god it will be available on Brazil! @Sakura I hear ya. I'm not sure Nintendo can convince me to move away from physical games when I get them for $10 off at launch at Best Buy. That will be a hard obstacle to overcome. If they say that all Wii-U Virtual Console purchases will be attached to the new account system and will work with the NX, I will transfer all of my Wii virtual console games over to the Wii-U in a heartbeat. Nintendo really needs to make digital purchases linked to your account and not the console like every other digital purchasing platform. Its sole purpose as an anti piracy attempt has been archaic since day 1. And seriously, open up communication for players, the parental controls already exist for the kids, restricting adults as well is stupid. @manu0 I'm with you there. I like being able to display games and on top of that when not buying on launch day physical games tend to be cheaper than digital anyway. What's worse, some collector's editions are pretty cool, and physical only. So basically nintendo doesn't care about people who actually want to display their products. So basically we got the wiiU digital deluxe promo. Yawn. @Mayoo I'm bothered by this as well. I still like buying things physical, and do so whenever there is an option. I think Shovel Knight is my lone exception b/c I didn't expect it to see a physical release. I hope more info comes out and they do reward their physical consumers as well. Otherwise they are alienating their fan base that likes to collect all the Nintendo stuff and show it off. Well, it COULD be. I really hope it is. . . .
@SuperCharlie78 I much preferred the Wii u premium scheme. I bought all my games digital and I got over £100 in discount over the term of the scheme. I was gutted when they stopped it. @XCWarrior I always preferred digital over anything. But my main problem is the ridiculous console memory. If I start doing that, I'll have to buy a dedicated external drive. At least for the Wii U. @Yorumi Well actually it's worse than the Digital Deluxe Promotion. With the gold points you will only get discounts on SPECIFIC titles, not money on your account as with the DDP. @Mayoo I have an external hard drive already for my WiiU, and that's just from eshop games and patches. I don't buy DLC, so that's not include. Yes, NX better have more space than what feels like 50 mb they left open for the WiiU. I only recently started downloading games more often then picking up physical. I hope the memory on my devices doesn't run out to fast once this launches. No physical rewards = no caring from me! I love the eShops, but if I have the choice to buy a game in physical form over digital, I won't hesitate to do it. Thanks for ruining what could've been a nice thing, Nintendo. I read the word "Cloud" multiple times and I only thought of Cloud Strife haha. If Nintendo wants to use cloud services extensively on NX, they should call it Lakitu Cloud Services. @manu0 true it's worse than that promotion. I'll register my account cause why not, but I'm not really expecting to get much out of it. I really want the ability to buy a game on the eShop, and once I do that have it able to be used on all my devices tied to my Nintendo Account. I hate repurchasing things for other devices. If there is a Wii U version of a 3DS game that I buy on the eShop I want that to be unlocked free on my Wii U(with some exceptions of course). Another example would be that I could buy a New 3DS XL because I'm still stuck on my regular XL and just sign in and go on the eShop and download everything(plus with cloud get all my saves on that device as well). This would be a huge quality of life improvement, and would be a huge deal in a market where digital games are becoming more and more popular over physical. @Mayoo Then again, external drives are cheap, and $60 probably net you more space than you will ever use. For example, I got 500GB (a portable one I had lying around anyways) on WiiU, 500GB on PS3, 250GB on X360, 2TB on X1 and 4TB on PS4 - my go-to platform for multi-plat games ... the only one that actually ran out of space at one point, is the PS3. Aside from what I get on PC, I get anything else on PS4, so I bought the biggest SSHD drive available for it, assuming it will last me through the generation, which I guess it will seeing as I just finished the first Terabyte recently. I only use the other consoles for exclusives (well, the X1 for racing games due to the lacking cross-support for wheels), which explains why the WiiU will only use a fraction of that 500GB drive (plus the games on that system are comparably tiny). I have not bought a single physical game this gen sofar, and I don't plan on changing that. Loading times are improved, most games have to be installed anyways, so do patches/dlc/addons, and most of all, it's just way too convenient to have games ready to launch at midnight without even bothering to go shopping for them/or ordering them, and the best part is still that I don't have all those discs and cases flying around, and I can just select whatever I want to play without searching out and changing any disc. @jjmesa16 Plus, the value of a digital game is zero as soon as it is purchased. The retail cart/DVD retains at least some value for re-sale. Not at all great for consumers. I'm not seeing rewards of any kind for physical purchases... Or the actual Club Nintendo-like physical rewards scheme. Er... 100 million subscribers? If ever a number was pulled from someone's behind, it's that one. 100 million people eventually picked up Wii consoles, because it was a fad. And with Nintendo's typical slowness in adopting and understanding new concepts, I have a concerned feeling about their understanding of the mobile space. Has my attention on re-reading. Does this mean, for instance, a game released only in the US can be bought in Europe? Or a game released only in the Japanese eShop can be downloaded in the US or Europe? Is this speculation? Can we just have Club Nintendo back, please? I would much prefer to spend my points on physical items (such as those cool dioramas, soundtracks, t-shirts, coins etc.). I know there was not always a lot available when Club Nintendo was around but that made it all the more special when something awesome did arrive on the store. I can't see myself get even half as excited over purely digital rewards. Yawn. Typical complaining on a service we know little of. Seems to be lacking compared to Club Nintendo based on what I have heard so far. I'm curious to see how easy it will be to register based on how bad Club Nintendo's servers were. @Quorthon No, the inclusion of "a feature that's long been available in North America and recently in Japan" means its referring to the fact you can buy stuff on a website rather than having to go on the console eshop. 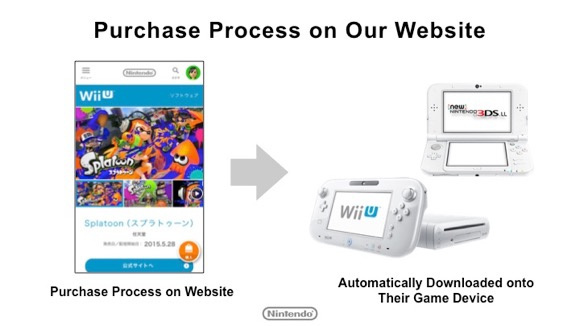 There's a "Buy digital" option to the right and that'll allow you to buy the content and then it'll be waiting for you when you go on your 3DS/Wii U. @abbyhitter I kinda hope that they would at least TRY to do something similar like that in the future. I'm hesitant to jump in on this when it's all digital, Nintendo's storage space is pitiful on 3DS and Wii U, so there's not a lot of room for the amount of digital purchases they're trying to encourage. This isn't going to catch on unless they either release some kind of console with a reasonable amount of storage or implements a similar program for physical goods. All I care about is purchases (particularly virtual console purchases) transferring between systems. 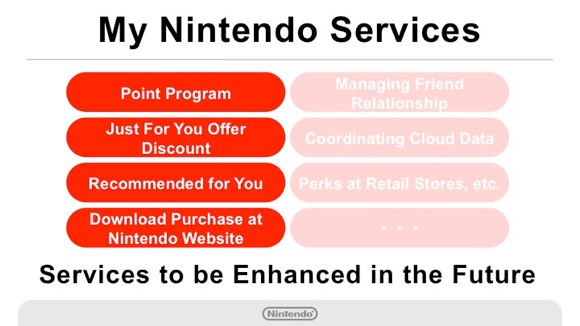 I also thought that this new point system was going to work like pepsi pass where you get points for visiting locations, playing games, and hanging out with other nintendo club members? Nintendo account and network ID need to be the same thing, games and purchases need to be tied to an account and not a console just like there competitors have done for years. Nintendo just seem to like to be difficult for the sake of it. The funny thing is the article talking about the power of this mysterious cloud to move save data and talk to friends properly as if these are new things. The reality being that playstation and xbox owners have done these things for many years and can sign into any console and play their games. The Wii U should have foxed this and the NX absolutely has to, Nintendo doesn't want to show the NX in case the others steal their ideas but maybe they should look at the competition to see where their own weaknesses are. Sounds bad to me! I am not made of money, so digital purchases are out for me. I get 20% off buying new from Amazon, I can save up to 50% buying used from Amazon Warehouse. I own three 3DS's for my self and my two kids, so this is another reason I don't buy digital because you can't share the games between the three of us. Nintendo just doesn't get - I am a Nintendo Fanboy who has owned every system Nintendo has, but they are making it harder and harder for me to continue my love of Nintendo. "Only Digital" is awful to me, and if they try push us a digital only console, for the first time since the Virtual Boy I'll skip a Nintendo console which to me, as a fan, is very sad. These things are ten a penny. It's a cheap way for companies to get your details and use them for marketing. The star rewards were for children. It was the same sort of tat the Nintendo Magazines used to give away. Don't forget that companies that offer points usually charge more for their products. I have played dozens of Smartphone games and I have never paid a penny to buy anything and I won't connect to Facebook to advertise a game. If I can't get past a level because it has been designed that you can't without spending money, that's where I leave the game and move on. There are plenty more games to play. I am happy to pay a reasonable price for a good game. But I won't be dragged into this new age marketing where as well as the game you have to buy add ons, Amiibos, Cards, extra lives, recommending others for coins, buying in game cash, etc etc. I prefer physical carts. If I do download a retail digital game that has a physical option, it's because it was on sale at a price that beats what I can get new or used, which is usually 1-2 (or more) years after initial release. This is disapointing, but whatever. What surprises me is it says nothing about offering points for buying systems. Will this change for the NX's release? I don't like how the physical games are not counted towards this, but I'd be fine with this as long as the NX has way more space on it for games. I have 32 gb wii u, and I have almost nothing on it, but I still don't have any space. It seems that the lack of physical rewards might be more of a Nintendo of America thing than a Nintendo Corporate thing. I have seen slide that has physical rewards attached to these points. 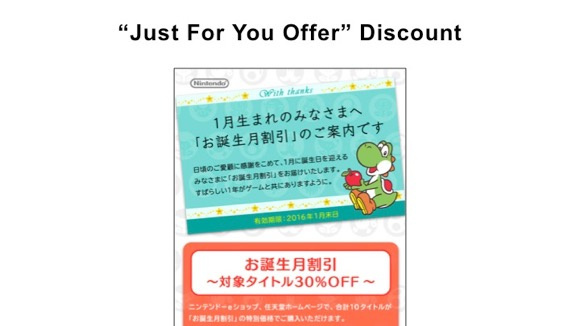 If I'm not mistaken, I thin NoA is the reason we didn't get the Club Nintendo rewards other people did. The news about My Nintendo sounds extremely positive to me. Maybe on closer inspection I might think differently. We need to see it in action but on paper it's a big leap for Nintendo. I see My Nintendo rewards being highly ignored by gamers, if not hated for "diverting" resources from the products they want. Gamers actively hated Club Nintendo in very territory including Japan. I really don't see My Nintendo swaying any gamers outside of a few big fans. It may sway some in the general public to buy Nintendo stuff, but not gamers. I mean you don't see Sony offering a rewards program for gaming and they are cleaning Microsoft's clock who offers a program that once in a blue moon offers a reward to users (normally nothing of value). Nintendo offered the best reward program by far out of all the gaming companies and yet it did nothing for sales. Ubisoft, EA, Activision, Bethesda and WB don't offer any rewards and they sell more games than everyone else each year. Hell I don't think any 3rd parties have a reward program anymore. Obviously gamers don't like rewards programs, because those companies that offered them would be getting the biggest share of business. Even retailers it has no impact. Gamestop has the best rewards program and yet they don't get the lions share of gaming purchases (Mine are quite good). Best Buy has My Best Buy Rewards, which is used on gaming too. Yet gamers actively avoid Best Buy. Toys R Us has a good rewards program, yet gamers don't shop there. Meijer's (Great Lakes Store) has a great rewards program that also applies to games, yet it doesn't help boost their gaming related sales. So far rewards programs seeming drive gamers way instead of getting them. They could POSSIBLY add physical game purchases to rewards for the NX games. But currently with Wii U and 3DS it'd be impossible to recall ALL games currently on shelves and add a redeemable code insert into the packaging. But, since this is set in motion before the release of NX and games it's quiet possible they could consider it by that time, considering there are going to be many to complain about this for now. They probably will support physical purchases on NX. They have also promised physical rewards too. So is there any mention of all te purchases between when Club Nintendo shut down and when this opens up? I definitely don't like the idea of this primarily being a digital focused rewards system since while I have no problem buying games digitally I don't do it near enough to make a true use of this. It is also silly to think that we will likely not receive any credit for the games we have purchased all of these years and if this is the case then why even bother allowing it on Wii U and 3DS at all? The systems are nearly at the end of their lives so most people will already own most of what can be bought on the systems rendering it useless for those who have been long time owners. I hope I am wrong and we do get credit for our purchases but I don't see it happening. Either way there are still alot of questions unanswered so I will reserve judgment until Nintendo sheds more light on this matter. That's a good idea...I usually have the same problem of forgetting to redeem points...which reminds me, I think I have some rewards on my credit card I haven't redeemed...hehe. It might even be cool to get notifications that show you how close you on our points to stuff on your wish list. 2016: The year of lots of talking points filling the calendar. "100 million people eventually picked up Wii consoles, because it was a fad"
I only care about proper account system and I hope it will be available from March. After reading the fine print given in the investor's meeting, I have a lot of problems with how this system operates. I listed it all on the other article, can't link it right now. I'll probably give this system a pass, if possible. Was it necessary to end Club Nintendo to only take almost a year to replace it?. Just curious. I'm glad they've brought "My Nintendo", but it seems like wii u digital deluxe promotion again but not as good. when the competition has "Games with Gold" and "Ps Plus", I expected something better. I'm just not excited. I'm willing to pay an annual subscription for amazing features. If they give me an account that isn't hardware locked I'll be happy. That is the main reason I haven't bothered with a New 3DS, I can only have one system per account. Also I'm not worried that it's not on par with games with gold or PS plus because generally I don't have an interest in 3 indies or 3 year old games every month. No physical rewards, that's too bad. I loved saving up for some Club Nintendo posters. Also we need to be able to link our accounts across consoles so that if our system breaks or is stolen we can re-download our games. That's one big reason that I won't buy digitally right now unless there won't be a physical release. Not sure I fully understand yet...but Ill wait and see. I don't know what to think of this but I don't buy any digital retail games so any points I get will be treated as a bonus for my eShop purchases. I'm not going to be trying to actively hit discount targets or anything. And that's fine. I'm pretty upset you will not get points for purchasing a physical copy of a game... I've been waiting a while for My Nintendo, I'm disappointed. @manu0 Hey, atleast you have amiibo as physical stuff. Who knows, maybe Nintendo will think of amiibo as physical rewards when you buy games. I wouldn't be disappointed because I just want the games. Prizes to me come second. "In other words, you won't need a Nintendo Network ID (via a Nintendo console) to create a Nintendo Account." That sentence is utterly ridiculous and helps sum up why Nintendo is losing the online marketplace. Their systems are totally convoluted. This makes me feel like a kid at chuck e cheese. I got a thousands tickets to spend mom.she spent like 100 dollars in coins. Run up to the reward stand what can I get with with my tickets well you got your choice of the plastic spider ring or this middle finger cause we ain't giving out phyical nada. I buy most of my Nintendo games physically so I don't know how much use this new system of theirs is going to get from me. I'll just hope there is more to this new feature than meets the eye. Otherwise I might end up a little disappointing. Especially since I don't make much use out of Smartphone apps. I'm mainly a game console type of guy. This account system appears more confusing than previously. It's simple: one account, one ID. Why the NNID, My Nintendo and Nintendo account? Even if Nintendo themselves wanted to differentiate, they could do that based on where you log in (i.e. If they want NNID 'data' just lift it from the console login) or even better: duplicate the log in details automatically so all accounts use the same details, even if different data is lifted from them. As for the rewards thing, I'm cool with it. I like physical goods as much as the next person but if digital games/discounts are the rewards, I'm totally cool with that. I'm really not interested in digital rewards or even digital downloads. I've embraced Steam for my PC gaming, but its super-convenient. Everything attached to my account, not my PC. Accessible on every PC I have. And its simple, one account and thats it. Not different ID's for this and that and the other thing. Hopefully when all is revealed this thing is actually user-friendly. Otherwise, I'll just be continuing with physical copies.